There are clothing stores, shoe stores, doctors’ offices, and recreation centers that are geared for people of certain ages. There are also dentists who specialize in treating patients of certain ages: pediatric, adolescent, young adult, seniors. While these dental practices may claim to “specialize” in a certain age range of dental issues, there are actually many more benefits of a family dentist. 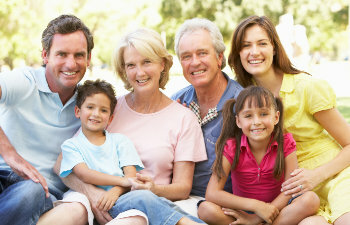 A family dentist serves all members and ages of a family. From a child’s first birthday to a grandparent’s 95th birthday, a family dentist can provide care for multiple generations. Not only does a family dentist offer comprehensive dental care, but there are also benefits from choosing a dental practice that serves the entire family. At Gold Hill Dentistry, we are proud to offer family dentistry to our patients. As a family dental practice we know how to provide care for multiple generations. Patients are encouraged to bring their young children with them for an appointment (with supervision) so that they can become familiar with good oral practices and how to handle their own dental cleanings. It is also beneficial to the clock and the wallet by having the same dentist treat the entire family. Instead of driving all over town from one appointment to the next, a family dental practice allows for members to have appointments back to back for convenience. And the most beneficial aspect of a family dentist is that a personal relationship will be developed. At Gold Hill Dentistry, we care for our patients on a personal basis. Seeing all members of a family allows us to notice even the slightest concern from one patient to another since many oral health issues are inherited. Gold Hill Dentistry provides high quality dental care in a warm environment for the entire family. Dr. Kavi Sagunarthy and Dr. Jennifer Mokris value the importance of your dental health and the relationship your mouth has with your entire body. You can trust our dental practice to help your entire family achieve a healthy, long-lasting smile. Call us today!